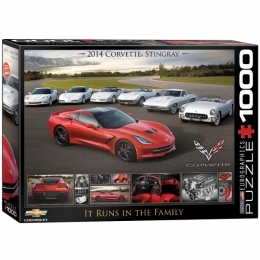 Corvette Stingray "It Runs In The Family" jigsaw puzzle. 1000 piece, measures 27" x 19" when completed. USA made with the highest quality blueboard for an exact fit without fraying or chipping over time. Made of 100% recycled materials which are non-toxic and safe for the whole family.